Recently, I bought a new home green energy program, the Green DIY Energy to see what it has to offer. I have a couple of similar residential homemade energy guides in my hard drive. What makes this one different? 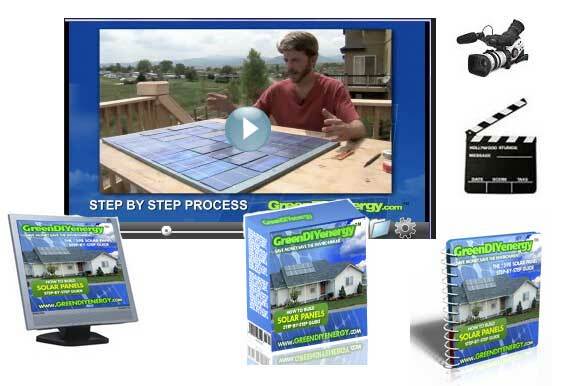 I would say the Unique Selling Proposition (USP) for the Green DIY Energy program is the “Build your own solar panel for less than $100” video series. To be honest, I am quite impressed with the quality of the videos. There are a total of 6 videos in the series. All of the videos were shot in High Definition (HD) using a professional film crew. Nice background, good music, good editing and a host that knows what he is talking about. All of the videos were shot in the backdrop of Boulder, Colorado. The host is Byran Clark. Is it really possible to make your own solar panel for under $100? Apparently you can get it done with such a low budget. Now, we are talking about 1 single panel, not the whole home solar power system. A complete system will involve more capital investment because you have to purchase components such as disconnect switch, charge controller, switch box, power inverter etc. After watching the videos, building a solar panel with a budget of about $100 is definitely possible. 1 solar panel will consist of only 36 Photovoltaic cells. You want to be able to get approximately 18 volts, 3 amps and a total power output of about 75 watts. That is enough to charge a deep cycle battery. The first step you want to take to make the solar panel at low cost is to buy some Photovoltaic (PV) cells from eBay. I actually did a blog post on how to find cheap solar cells a couple of weeks ago. When you’ve gotten all the cells, your next step is to check each and every cell to see if it’s in good working condition. To do this, you will need a multi-meter. If you have never use a multi-meter before, luckily there is a video in Green DIY Energy what will show you how. If the cells are working fine, your next step is to solder all of them together in series. The recommended arrangement is 4 cells across and 9 cells down. All the cells are to be placed in a box made from plywood and wood strips. After the box is coated with UV protective paint, fix the PV cells on with some silicon glue and then cover it with a piece of UV proof Plexiglas. And that is how you make your own solar panel for less than $100. If you want to know more about Green DIY Energy, check out the comprehensive Green DIY Energy review at www.greendiyenergyreviews.com. 1) Magnets 4 Energy Review – A comprehensive review of Magnets4Energy: Generate energy at home with magnet powered electric generator. Good tips for learning about solar solar panel.